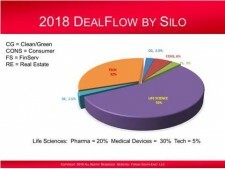 PHILADELPHIA, February 22, 2019 (Newswire.com) – Keiretsu Forum Mid-Atlantic and Keiretsu Forum South-East, part of the world’s largest angel investment network, announces that members made 32 investments in new companies from the 40 who presented in 2018; that is an 80 percent rate of investment. In addition, members made 34 follow-on investments in existing portfolio companies. The total investment, as reported by members*, was $6.9 million. This level of engagement and contribution sets a new benchmark for the organization and a multi-year trend of growth. The portfolio companies and volume of investments is indicative of the positive picture for angel investing across the United States. Of the 66 different companies that Keiretsu Forum Mid-Atlantic and Keiretsu Forum South-East invested in during 2018, 55 percent of those are in the Life Sciences sector and 32 percent in the Tech sector. This is largely reflective of the startup ecosystems in our region, however, one of the significant advantages of Keiretsu Forum is that investment deals are made in a syndication effort with Pacific Northwest and other global regions. The data in the provided chart reveals an overall depiction of 2018 investment activity. For additional information, entrepreneurs should visit http://keiretsuforum-midatlantic.com/entrepreneurs and access an application at http://keiretsuforum-midatlantic.com/application. * Data reflects reporting from 65 percent of the membership. Keiretsu Forum Mid-Atlantic is part of Keiretsu Forum, the world’s largest and most active investment community of early-stage angel investors. Founded in California in 2000, Keiretsu Forum now includes 55 chapters on four continents. For more information about Keiretsu Forum Mid-Atlantic, visit Keiretsuforum-midatlantic.com.